This article is about the capital of French Guiana. For other uses, see Cayenne (disambiguation). Cayenne (/keɪˈɛn/; French pronunciation: ​[kajɛn]) is the capital city of French Guiana, an overseas region and department of France located in South America. The city stands on a former island at the mouth of the Cayenne River on the Atlantic coast. The city's motto is "fert aurum industria", which means "work brings wealth". At the 2016 census, there were 137,964 inhabitants in the metropolitan area of Cayenne (as defined by INSEE), 60,580 of whom lived in the city (commune) of Cayenne proper. 2003 (left) and 2012 (right) aerial views of Cayenne. Note: the mangrove, which had invaded the coastline of Cayenne in the late 2000s, has completely disappeared as of the late 2010s. Cayenne is a commune of the French Republic and as such it is ruled by a mayor and a municipal council. The current mayor is Marie-Laure Phinéra-Horth, a former member of the Guianese Socialist Party who is supported by various left-wing parties. Marie-Laure Phinéra-Horth has been mayor of Cayenne since 2010. She is the daughter of a former president of the General Council of French Guiana, Stéphan Phinéra-Horth, from the Guianese Socialist Party, who ruled the department of French Guiana from 1994 to 1998. As in the rest of France, the small size of the commune of Cayenne (only 23.6 km²), which doesn't cover the entire urban area of Cayenne, has led to the creation of an intercommunal authority which groups Cayenne and 5 suburban communes: the communauté d'agglomération du Centre Littoral (5,087 km²). Marie-Laure Phinéra-Horth has been president of the communauté d'agglomération du Centre Littoral since 2014. This intercommunal structure, which levies its own taxes, is the sole authority in charge of refuse collection, water supply and sewage treatment, urban planning, and public transports over the 5,087 km² of Cayenne and its suburbs. Until 2015, the commune of Cayenne was divided in six cantons, but these were abolished in 2015 when the department and the region of French Guiana were abolished and replaced by the French Guiana Territorial Collectivity. Initially it was a place arranged to ventilate the city after the demolition of the walls in 1810. The place being occupied by herbs, it was therefore called Place de la Savane. Later they planted royal palms of Guisanbourg, and it became the place of the Palmistes. In 1880, a bronze column was erected bearing the bust of the Republic commemorating the taking of the Bastille. Under Governor Gerville-Reache transformed the place into an English garden, with artificial hills, flower beds and ornamental plants. Because of the rains, the place was regularly flooded, which is why Governor Chanel in 1925 bordered it with a network of cemented canals that can still be found today. There is a statue of Félix Éboué, an illustrious Guianan character, in place of the Merlet fountain. Today it is a place of life, meeting Cayenese. In the evening, trailers sell French fries, sandwiches, bamis and nassi (Javanese specialties), local juices and other takeaways. Le jardin botanique de Cayenne, with the Gaston Monnerville statue in its center. In 1786, Louis XVI had a garden that served as a deposit and nursery for various plants and trees from various destinations. Louis Claude Richard, director of the garden was responsible for bringing from India muscadiers, rattans, trees in, feet of cardamom and pepper. During this period, it was called King's Garden. In 1821 a house was built for the botanist. In 1879, he changed his name and became Botanical Garden is a floral park in the city center. It covers an area of three hectares. There is a Gaston Monnerville statue in the center of the garden. Right aisle of the Cayenne market. These two adjoining buildings are located near the old port of Cayenne. As early as 1703, a Place du Port appears on a map of the city of Cayenne, it then becomes Place du Marché in 1842. In 1888, a covered market and a public garden were built there. In 1907 the municipal council led by the mayor Eugène Gobert decides the removal of the garden for the construction of a new covered market, the one that we know today. In 1920 on the site of the old market was inaugurated the war memorial of the First World War surmounted by a rooster, which gave it the current name of the place. Saint-Sauveur Cathedral of Cayenne after its renovation of 2005. 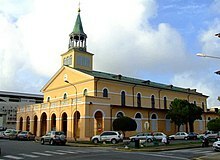 In 1823, the Reverend Father Nicolas Guiller and Baron Pierre Bernard Milius, administrator of French Guiana decided to replace the old church of Cayenne, the Church of St. Nicholas to the current place Leopold Heder. Work begun in 1825 was completed in 1833. The church was inaugurated in 1861. It is classified as a Historic Monument. The high altar, the pulpit and the confessional of the chapel of the penitentiary of Ilet la Mère were transferred to the cathedral in 1876. In 1933, the Apostolic Prefecture of French Guiana was transformed into a vicariate, the Apostolic Prefect became bishop. The church also changes status and becomes cathedral. It is consecrated as a cathedral on November 9, 1934 by Bishop Gourtay, then the first bishop of Guiana. In 1952, it was enlarged, during the work the workers found an inset lead cassette containing 21 coins, the oldest of which dates from Napoleon I and 20 seals from the time of Charles X. Between 1952 and 1954 to the east on 13 m, the ceiling, the stained glass windows, the floors of the tribune, are replaced. The Saint-Sauveur Cathedral of Cayenne has been recently renovated. Carnival in the Cayenne streets in 2006. 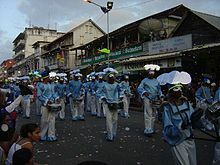 Carnival parade in the Cayenne streets in 2007. The carnival is one of the major events of the Capital. It takes place between Epiphany in early January and Ash Wednesday in February or March. This festival belongs to the Guianan Creole culture. 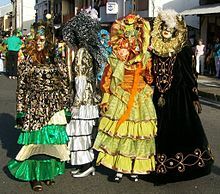 It is originally carnival as practiced in Europe. At the beginning of the colonization, the colonists practiced the carnival, but it was forbidden to the slaves. Braving ban, the slaves practiced the carnival, in the clandestine festivals. They were regaining some freedom, commemorating Africans, fertility and harvest, and making fun of settlers. Fat Sunday: this is the day of the grand parade, the biggest carnival parade. concurrent groups to get prizes based on their performance. fat Monday: burlesque marriages, men dress up for brides and women for married couples. Mardi Gras: the carnivals go by in Diab rouj, everyone dresses in red and black. Ash Wednesday: black and white devils bury Vaval, the king of the carnival. Groups disguised according to the theme of the year, and around decorated characters, to the rhythm of drums and brass. The preparation of the groups last from the month before the carnival. The groups parade in front of the thousands of spectators who are massed on the sidewalks and the stands arranged for the occasion. Brazilian bands similar to those at the Rio Carnival are also appreciated for their alluring rhythms and costumes. The Asian community of Cayenne also participates in the changes made by a characteristic touch, with the dragons. The night business, called "Universities", organizes masked balls during which men come to dance with the Touloulous. Evenings are held on Friday and Saturday nights. This tradition is peculiar to French Guiana, it does not exist anywhere else. Since the 1990s, Tololo parties have been held, where men disguise themselves and play the role of the Touloulous. These evenings are more and more popular and take place several times during the carnival. 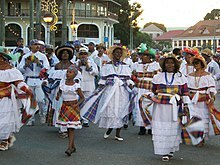 The carnival dances are mazurka, biguine and piké djouk. It is the Touloulou who invites men to dance, they can not refuse. Only the Touloulous have the right to dance, if a woman is not disguised, the orchestra stops. The Cayenne Ballroom is called Nana, where the Blues Star band plays. Cayenne is served by the Cayenne – Félix Eboué Airport, which is located in the neighbouring commune of Matoury. There are two flights a day to Paris (Orly Airport), served by Air France and Air Caraïbes. The flight time from Cayenne to Paris is 8 hours and 10 minutes, and from Paris to Cayenne it is 8 hours and 30 minutes. There are also flights to Fort-de-France, Pointe-à-Pitre, Belém, and Fortaleza. The French folk song "Cayenne", tells the story of a pimp who shoots a well-to-do client who grossly disrespected a prostitute, and is then convicted and transferred to the infamous penitentiary. ^ a b c d e INSEE. "Historique des populations légales". Retrieved 12 January 2019. ^ INSEE. "Base des unités urbaines". Retrieved 31 December 2017. ^ a b c INSEE. "Base des aires urbaines". Retrieved 31 December 2017. ^ "page concernant le blason de la ville sur le site page de Redris". Pagesperso-orange.fr. Retrieved 13 March 2011. ^ Confins. "Avancées et reculs de la mangrove à Cayenne". Retrieved 12 January 2019. ^ "Données climatiques de la station de Matoury" (in French). Meteo France. Retrieved 9 December 2014. ^ "Climat Guyane". Meteo France. Retrieved 9 December 2014. ^ SPLAF (Site sur la Population et les Limites Administratives de la France). "Agglomérations et villes de la Guyane". Retrieved 14 January 2019. ^ "Recensement de la population de 2012 - Individus localisés au canton-ou-ville en 2012". INSEE. Retrieved 2 February 2019. ^ "French Guiana | history - geography - territorial collectivity, France". Encyclopædia Britannica. Retrieved 8 December 2016. ^ "Cayenne | French Guiana". Encyclopædia Britannica. Retrieved 8 December 2016. "Cayenne" . Encyclopædia Britannica. 5 (11th ed.). 1911.